Looking for free content to watch or listen to on your iPhone, iPad or Apple TV? If so, great news: Apple has created a new section on iTunes called “Free on iTunes” that lets you download a number of songs and television shows at no cost to you. Naturally, Apple’s selection of free content is nowhere near as good as its paid selection. You won’t find any hits from the likes of Taylor Swift, but you will (currently) see an assortment of 16 songs from artists like Lifehouse, Sharon Van Etten and Penguin Prison. The selection of free television shows is a bit more interesting, including the season premiere of TBS’s King of the Nerds, SyFy’s 12 Monkeys, Disney’s Miles from Tomorrowland, Food Network’s Ace of Cakes and my mother’s personal favorite, HGTV’s Fixer Upper. None of it exactly qualifies as top-tier content, but again, you can’t beat the price. This isn’t the first time Apple has experimented with giving content away for free. Earlier, the company had run – and discontinued – a free feature promoted as “Single of the Week.” We don’t know if Apple plans to update its new Free on iTunes section on a weekly basis, but it appears that the Apple-curated section will likely rotate. So if you don’t like the current selection of freebies, check back later. 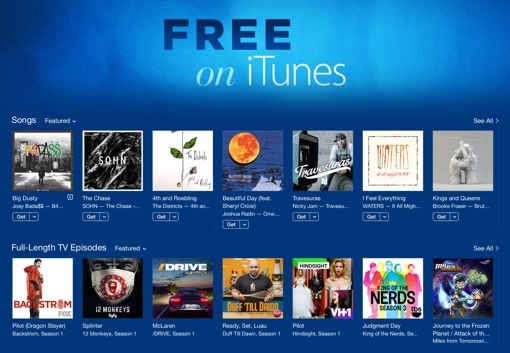 You can find the new Free on iTunes section on iTunes via this link. You might also want to check out these other places to get free music online, as well.